Coccidioidomycosis (/kɒkˌsɪdiɔɪdoʊmaɪˈkoʊsɪs/, kok-sid-ee-oy-doh-my-KOH-sis), commonly known as cocci, Valley fever, as well as California fever, desert rheumatism, and San Joaquin Valley fever, is a mammalian fungal disease caused by Coccidioides immitis or Coccidioides posadasii. Coccidioidomycosis is endemic in certain parts of Arizona, California, Nevada, New Mexico, Texas, Utah, and northern Mexico. C. immitis is a dimorphic saprophytic fungus that grows as a mycelium in the soil and produces a spherule form in the host organism. It resides in the soil in certain parts of the southwestern United States, most notably in California and Arizona. It is also commonly found in northern Mexico, and parts of Central and South America. C. immitis is dormant during long dry spells, then develops as a mold with long filaments that break off into airborne spores when it rains. The spores, known as arthroconidia, are swept into the air by disruption of the soil, such as during construction, farming, or an earthquake. Windstorms may also cause epidemics far from endemic areas. In December 1977, a windstorm in an endemic area around Arvin, California led to several hundred cases, including deaths, in non-endemic areas hundreds of miles away. Coccidioidomycosis is a common cause of community-acquired pneumonia in the endemic areas of the United States. Infections usually occur due to inhalation of the arthroconidial spores after soil disruption. The disease is not contagious. In some cases the infection may recur or become chronic. An estimated 60% of people infected with the fungi responsible for coccidioidomycosis have minimal to no symptoms, while 40% will have a range of possible clinical symptoms. Of those who do develop symptoms, the primary infection is most often respiratory, with symptoms resembling bronchitis or pneumonia that resolve over a matter of a few weeks. In endemic regions, coccidioidomycosis is responsible for 20% of cases of community-acquired pneumonia. Notable coccidioidomycosis signs and symptoms include a profound feeling of tiredness, fever, cough, headaches, rash, muscle pain, and joint pain. Fatigue can persist for many months after initial infection. The classic triad of coccidioidomycosis known as "desert rheumatism" includes the combination of fever, joint pains, and erythema nodosum. 3% to 5% of infected individuals do not recover from the initial acute infection and develop a chronic infection. This can take the form of chronic lung infection or widespread disseminated infection (affecting the tissues lining the brain, soft tissues, joints, and bone). Chronic infection is responsible for most of the morbidity and mortality. Chronic fibrocavitary disease is manifested by cough, sputum, fevers, night sweats and weight loss. Osteomyelitis, including involvement of the spine, and meningitis may occur months to years after initial infection. Severe lung disease may develop in HIV-infected persons. Serious complications may occur in patients who have weakened immune systems, including severe pneumonia with respiratory failure and bronchopleural fistulas requiring resection, lung nodules, and possible disseminated form, where the infection spreads throughout the body. The disseminated form of coccidioidomycosis can devastate the body, causing skin ulcers, abscesses, bone lesions, swollen joints with severe pain, heart inflammation, urinary tract problems, and inflammation of the brain's lining, which can lead to death. Both Coccidioides species share the same asexual life cycle, switching between saprobic (on left) and parasitic (on right) life stages. It must rain first to start the cycle of initial growth of the fungus underneath the soil. In soil (and in agar media), Coccidioides exist in filament form. It forms hyphae in both horizontal and vertical directions. Over a prolonged dry period, cells within hyphae degenerate to form alternating barrel-shaped cells (arthroconidia). Arthroconidia are light-weight and carried by air currents. This happens when the soil is disturbed often by clearing trees, construction and farming. As the population grows, so have all these industries, causing a potential cascade effect. The more land that is cleared, the more arid the soil, the riper the environment for Coccidioides. These spores can be easily inhaled without the person knowing. On arriving in alveoli, they enlarge in size to become spherules, and internal septations develop. This division of cells is made possible by the optimal temperature inside the body. Septations develop and form endospores within the spherule. Rupture of spherules release these endospores, which in turn repeat the cycle and spread the infection to adjacent tissues within the body of the infected individual. Nodules can form in lungs surrounding these spherules. When they rupture, they release their contents into bronchi, forming thin-walled cavities. These cavities can result in symptoms like characteristic chest pain, coughing up blood, and persistent cough. In individuals with a weakened immune system, the infection can spread through the blood. On rare occasion it can enter the body through a break in the skin, causing infection. Coccidioidomycosis diagnosis relies on a combination of an infected person's signs and symptoms, findings on radiographic imaging, and laboratory results. The disease is commonly misdiagnosed as bacterial community-acquired pneumonia. The fungal infection can be demonstrated by microscopic detection of diagnostic cells in body fluids, exudates, sputum and biopsy tissue by methods of Papanicolaou or Grocott's methenamine silver staining. These stains can demonstrate spherules and surrounding inflammation. With specific nucleotide primers, C.immitis DNA can be amplified by polymerase chain reaction (PCR). It can also be detected in culture by morphological identification or by using molecular probes that hybridize with C.immitis RNA. C. immitis and C. posadasii cannot be distinguished on cytology or by symptoms, but only by DNA PCR. An indirect demonstration of fungal infection can be achieved also by serologic analysis detecting fungal antigen or host IgM or IgG antibody produced against the fungus. The available tests include the tube-precipitin (TP) assays, complement fixation assays, and enzyme immunoassays. TP antibody is not found in cerebrospinal fluid (CSF). TP antibody is specific and is used as a confirmatory test, whereas ELISA is sensitive and thus used for initial testing. If the meninges are affected, CSF will show abnormally low glucose levels in CSF, an increased level of protein in the CSF, and lymphocytic pleocytosis. Rarely, CSF eosinophilia is present. 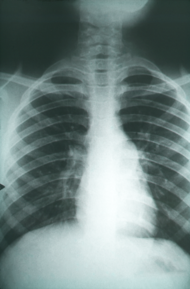 Chest x-rays rarely demonstrate nodules or cavities in the lungs, but these images commonly demonstrate lung opacification, pleural effusions, or enlargement of lymph nodes associated with the lungs. Computed tomography scans of the chest are better able to detect these changes than chest x-rays. Preventing Valley fever is challenging because it is difficult to avoid breathing in the fungus should it be present, however, the public health effect of the disease is essential to understand in areas where the fungus is endemic. Enhancing surveillance of Coccidiodomycosis is key to preparedness in the medical field in addition to improving diagnostics for early infections. Currently there are no completely effective preventive measures available for people who live or travel through Valley Fever -endemic areas. Recommended preventive measures include avoiding airborne dust or dirt, but this does not guarantee protection against infection. People in certain occupations may be advised to wear face masks. The use of air filtration indoors is also helpful, in addition to keeping skin injuries clean and covered to avoid skin infection. In 1998-2011, there were 111,117 cases of coccidioidomycosis in the U.S. that were logged into the National Notifiable Diseases Surveillance System (NNDSS). Since many U.S. states do not require reporting of coccidioidomycosis, the actual numbers can be higher. The United States' Centers for Disease Control and Prevention (CDC) called the disease a "silent epidemic" and acknowledged that there is no proven anticoccidioidal vaccine available. Studies done in the past show that the cost benefit of a vaccine is most notable among infants, teens, and immigrant adults, with negative cost-benefit results among older age groups. Raising both surveillance and awareness of the disease while medical researchers are developing a human vaccine can positively contribute towards prevention efforts. Research demonstrates that patients from endemic areas who are aware of the disease are most likely to request diagnostic testing for coccidioidomycosis. Presently, Meridian Bioscience manufactures the so-called EIA test to diagnose the Valley fever, which however is known for producing a fair quantity of false positives. Currently, recommended prevention measures can include type-of-exposure-based respirator protection for persons engaged in agriculture, construction and others working outdoors in endemic areas. Dust control measures such as planting grass and wetting the soil, and also limiting exposure to dust storms are advisable for residential areas in endemic regions. Significant disease develops in fewer than 5% of those infected and typically occurs in those with a weakened immune system. Mild asymptomatic cases often do not require any treatment, and the symptoms will go away within a few months. Those with severe symptoms may benefit from anti-fungal therapy, which usually requires 3–6 months of treatment. There is a lack of prospective studies that examine optimal anti-fungal therapy for coccidioidomycosis. On the whole, oral fluconazole and intravenous amphotericin B are used in progressive or disseminated disease, or in immunocompromised individuals. Amphotericin B used to be the only available treatment, although now there are alternatives, including itraconazole or ketoconazole may be used for milder disease. Fluconazole is the preferred medication for coccidioidal meningitis, due to its penetration into CSF. Intrathecal or intraventricular amphotericin B therapy is used if infection persists after fluconazole treatment. Itraconazole is used for cases that involve treatment of infected person's bones and joints. The antifungal medications posaconazole and voriconazole have also been used to treat coccidioidomycosis. Because the symptoms of valley fever are similar to the common flu and other respiratory diseases, it is important for public health professionals to be aware of the rise of valley fever and the specifics of diagnosis. Greyhound dogs often get valley fever as well, and their treatment regimen involves 6–12 months of ketoconazole, to be taken with food. Conventional amphotericin B desoxycholate (AmB: used since the 1950s as a primary agent) is known to be associated with increased drug-induced nephrotoxicity (kidney toxicity) impairing kidney function. Other formulations have been developed such as lipid soluble formulations to mitigate such side-effects as direct proximal and distal tubular cytotoxicity. These include liposomal amphotericin B, amphotericin B lipid complex such as Abelcet (brand) amphotericin B phospholipid complex also as AmBisome Intravenous, or Amphotec Intravenous (Generic; Amphotericin B Cholesteryl Sul) and, amphotericin B colloidal dispersion, all shown to exhibit a decrease in nephrotoxicity. The later was not as effective in one study as amphotericin B desoxycholate which had a 50% murine morbidity rate versus zero for the AmB colloidal dispersion. The cost of AmB deoxycholate, in 2015, for a patient of 70 kilograms (150 lb) at 1 mg/kg/day dosage, was approximately $63.80, compared to 5 mg/kg/day of liposomal AmB at $1318.80, making the less toxic option less accessible. Coccidioidomycosis is endemic to the western hemisphere between 40°N and 40°S. The ecological niches are characterized by hot summers and mild winters with an annual rainfall of 10–50 cm. The species are found in alkaline sandy soil, typically 10–30 cm below the surface. In harmony with the mycelium life cycle, incidence increases with periods of dryness after a rainy season; this phenomenon, termed "grow and blow", refers to growth of the fungus in wet weather, producing spores which are spread by the wind during succeeding dry weather. While the majority of cases are observed in the endemic region, cases reported outside the area are generally visitors, who contact the infection and return to their native areas before becoming symptomatic. In the United States, C. Immitis is endemic to southern and central California with the highest presence in the San Joaquin Valley. C. posadassi is most prevalent in Arizona, although it can be found in a wider region spanning from Utah, New Mexico, Texas, and Nevada. An estimated 150,000 infections occur annually, with 25,000 new infections occurring every year. The incidence of coccidioidomycosis in the United States in 2011 (42.6 per 100,000) was almost ten times higher than the incidence reported in 1998 (5.3 per 100,000). In area where it is most prevalent, the infection rate is 2-4%. Incidence varies widely across the west and southwest. In Arizona, for instance, in 2007, there were 3,450 cases in Maricopa County, which in 2007 had an estimated population of 3,880,181 for an incidence of approximately 1 in 1,125. In contrast, though southern New Mexico is considered an endemic region, there were 35 cases in the entire state in 2008 and 23 in 2007, in a region that had an estimated 2008 population of 1,984,356, for an incidence of approximately 1 in 56,695. Infection rates vary greatly by county, and although population density is important, so are other factors that have not been proven yet. Greater construction activity may disturb spores in the soil. In addition, the effect of altitude on fungi growth and morphology has not been studied, and altitude can range from sea level to 10,000 feet or higher across California, Arizona, Utah and New Mexico. In California from 2000 to 2007, there were 16,970 reported cases (5.9 per 100,000 people) and 752 deaths of the 8,657 people hospitalized. The highest incidence was in the San Joaquin Valley with 76% of the 16,970 cases (12,855) occurring in the area. Following the 1994 Northridge earthquake, there was a sudden increase of cases in the areas affected by the quake, at a pace of over 10 times baseline. There was an outbreak in the summer of 2001 in Colorado, away from where the disease was considered endemic. A group of archeologists visited Dinosaur National Monument, and eight members of the crew, along with two National Park Service workers were diagnosed with Valley fever. California state prisons, beginning in 1919, have been particularly affected by coccidioidomycosis. In 2005 and 2006, the Pleasant Valley State Prison near Coalinga and Avenal State Prison near Avenal on the western side of the San Joaquin Valley had the highest incidence in 2005, of at least 3,000 per 100,000. The receiver appointed in Plata v. Schwarzenegger issued an order in May 2013 requiring relocation of vulnerable populations in those prisons. The incidence rate has been increasing, with rates as high as 7% during 2006-2010. The cost of care and treatment is $23 million in California prisons. A lawsuit was filed against the state in 2014 on behalf of 58 inmates stating that the Avenal and Pleasant valley state prisons did not take necessary steps to prevent infections. There are several populations that have a higher risk for contracting coccidioidomycosis and developing the advanced disseminated version of the disease. Populations with exposure to the airborne arthroconidia working in agriculture and construction have a higher risk. Outbreaks have also been linked to earthquakes, windstorms and military training exercises where the ground is disturbed. Historically an infection is more likely to occur in males than females, although this could be attributed to occupation rather than gender specific. Women who are pregnant and immediately postpartum are at a high risk of infection and dissemination. There is also an association between stage of pregnancy and severity of the disease, with third trimester women being more likely to develop dissemination. Presumably this is related to highly elevated hormonal levels, which stimulate growth and maturation of spherules and subsequent release of endospores. Certain ethnic populations are more susceptible to disseminated coccioidomycosis. The risk of dissemination is 175 times greater in Filipinos and 10 times greater in African Americans than non-Hispanic whites. Individuals with a weakened immune system are also more susceptible to the disease. In particular, individuals with HIV and diseases that impair T-cell function. Individuals with pre-existing conditions such as diabetes are also at a higher risk. Age also affects the severity of the disease, with more than one third of deaths being in the 65-84 age group. An animal infected with Valley fever cannot transmit the disease to other animals. In dogs, the most common symptom of coccidioidomycosis is a chronic cough, which can be dry or moist. Other symptoms include fever (in approximately 50% of cases), weight loss, anorexia, lethargy, and depression. The disease can disseminate throughout the dog's body, most commonly causing osteomyelitis (infection of the bone marrow), which leads to lameness. Dissemination can cause other symptoms, depending on which organs are infected. If the fungus infects the heart or pericardium, it can cause heart failure and death. In cats, symptoms may include skin lesions, fever, and loss of appetite, with skin lesions being the most common. Other species in which Valley fever has been found include livestock such as cattle and horses; llamas; marine mammals, including sea otters; zoo animals such as monkeys and apes, kangaroos, tigers, etc. ; and wildlife native to the geographic area where the fungus is found, such as cougars, skunks, and javelinas. The first case of what was later named coccidioidomycosis was described in 1892 in Buenos Aires by Alejandro Posadas, a medical intern at the Hospital de Clínicas "José de San Martín". Posadas established an infectious character of the disease after being able to transfer it in laboratory conditions to lab animals. In the U.S., Dr. Myrnie Gifford who was a health officer, E. Rixford, a physician from a San Francisco hospital, and T. C. Gilchrist, a pathologist at Johns Hopkins Medical School, became early pioneers of clinical studies of the infection. They decided that the causative organism was a Coccidia-type protozoan and named it Coccidioides immitis (resembling Coccidia, not mild). Dr Gifford discovered that the etiological agent of the disease that was at first called Coccidioides infection and later coccidioidomycosis was a fungal pathogen, and coccidioidomycosis was also distinguished from Histoplasmosis and Blastomycosis. Further, Coccidioides immitis was identified as the culprit of respiratory disorders previously called San Joaquin Valley fever, desert fever, and Valley fever, and a serum precipitin test was developed by Charles E. Smith that was able to detect an acute form of the infection. In retrospect, Smith played a major role in both medical research and raising awareness about coccidioidomycosis, especially when he became dean of the School of Public Health at the University of California at Berkeley in 1951. Coccidioides immitis was considered by the United States during the 1950s and 1960s as a potential biological weapon. The strain selected for investigation was designated with the military symbol OC, and initial expectations were for its deployment as a human incapacitant. Medical research suggested that OC might have had some lethal effects on the populace, and Coccidioides immitis started to be classified by the authorities as a threat to public health. However, Coccidioides immitis was never weaponized to the public's knowledge, and most of the military research in the mid-1960s was concentrated on developing a human vaccine. Currently, it is not on the U.S. Department of Health and Human Services' (HHS) or Centers for Disease Control and Prevention's list of select agents and toxins. In 2002, Coccidioides posadasii was identified as genetically distinct from Coccidioides immitis despite their morphologic similarities and can also cause coccidioidomycosis. As of 2013, there is no vaccine available to prevent infection with Coccidioides immitis or Coccidioides posadasii, but efforts to develop such a vaccine are underway. Thunderhead, a 1998 novel by Douglas Preston and Lincoln Child which uses the fungus and illness as a central plot point. ^ a b c d e f g h i j k l m n Malo J, Luraschi-Monjagatta C, Wolk DM, Thompson R, Hage CA, Knox KS (February 2014). "Update on the diagnosis of pulmonary coccidioidomycosis". Ann Am Thor Soc. 11 (2): 243–53. doi:10.1513/AnnalsATS.201308-286FR. PMID 24575994. ^ a b Nguyen C, Barker BM, Hoover S, Nix DE, Ampel NM, Frelinger JA, Orbach MJ, Galgiani JN (July 2013). "Recent advances in our understanding of the environmental, epidemiological, immunological, and clinical dimensions of coccidioidomycosis". Clin Microbiol Rev. 26 (3): 505–25. doi:10.1128/CMR.00005-13. PMC 3719491. PMID 23824371. ^ Hector R, Laniado-Laborin R (2005). "Coccidioidomycosis—A Fungal Disease of the Americas". PLoS Med. 2 (1): e2. doi:10.1371/journal.pmed.0020002. PMC 545195. PMID 15696207. ^ Schneider E, Hajjeh RA, Spiegel RA, et al. (1997). "A coccidioidomycosis outbreak following the Northridge, Calif, earthquake". JAMA. 277 (11): 904–8. doi:10.1001/jama.277.11.904. PMID 9062329. ^ Pappagianis, Demosthenes; Einstein, Hans (1978-12-01). "Tempest From Tehachapi Takes Toll or Coccidioides Conveyed Aloft and Afar". Western Journal of Medicine. 129 (6): 527–530. ISSN 0093-0415. PMC 1238466. PMID 735056. ^ a b c d e Twarog, Meryl; Thompson, George (2015-09-23). "Coccidioidomycosis: Recent Updates". Seminars in Respiratory and Critical Care Medicine. 36 (5): 746–755. doi:10.1055/s-0035-1562900. PMID 26398540. ^ Ampel N (2005). "Coccidioidomycosis in persons infected with HIV type 1". Clin Infect Dis. 41 (8): 1174–8. doi:10.1086/444502. PMID 16163637. ^ Galgiani J. N. Coccidioidomycosis. In: Cecil, Russell L., Lee Goldman, and D. A. Ausiello. Cecil Medicine. Philadelphia: Saunders Elsevier, 2007. ^ Kolivras K., Comrie A. (2003). "Modeling valley fever (coccidioidomycosis) incidence on the basis of climate conditions". International Journal of Biometeorology. 47 (2): 87–101. doi:10.1007/s00484-002-0155-x. PMID 12647095. ^ "Mayo Clinic". Valley Fever. Mayo Clinic. May 27, 2015. Retrieved September 30, 2015. ^ a b "CDC". Fungal diseases: valley fever. CDC. July 20, 2015. Retrieved September 30, 2015. ^ a b Hector, Richard F.; Rutherford, George W.; Tsang, Clarisse A.; Erhart, Laura M.; McCotter, Orion; Anderson, Shoana M.; Komatsu, Kenneth; Tabnak, Farzaneh; Vugia, Duc J. (2011-04-01). "The Public Health Impact of Coccidioidomycosis in Arizona and California". International Journal of Environmental Research and Public Health. 8 (4): 1150–1173. doi:10.3390/ijerph8041150. ISSN 1661-7827. PMC 3118883. PMID 21695034. ^ "Risk factors". Valley Fever Center for Excellence. ^ "Increase in Reported Coccidioidomycosis—United States, 1998–2011". Morbidity and Mortality Weekly Report (MMWR). Centers for Disease Control and Prevention. Retrieved 6 July 2013. ^ "Valley Fever: Awareness is Key". CDC Features. Centers for Disease Control and Prevention. Retrieved 6 July 2013. ^ Barnato, A. E.; Sanders, G. D.; Owens, D. K. (2001-01-01). "Cost-effectiveness of a potential vaccine for Coccidioides immitis". Emerging Infectious Diseases. 7 (5): 797–806. doi:10.3201/eid0705.010005. ISSN 1080-6040. PMC 2631863. PMID 11747691. ^ Cole G.T. ; Xue J.M. ; Okeke C.N. ; at al. (June 2004). "A vaccine against coccidioidomycosis is justified and attainable". Medical Mycology. 42 (3): 189–216. doi:10.1080/13693780410001687349. PMID 15283234. ^ "Valley Fever Vaccine Project" (PDF). Archived from the original (PDF) on February 1, 2014. Retrieved 11 July 2013. ^ Tsang C.A. ; Anderson S.M. ; Imholte S.B. ; et al. (2010). "Enhanced surveillance of coccidioidomycosis, Arizona, USA, 2007–2008". Emerging Infectious Diseases. 16 (11): 1738–44. doi:10.3201/eid1611.100475. PMC 3294516. PMID 21029532. ^ Das R.; McNary J.; Fitzsimmons K.; et al. (May 2012). "Occupational coccidioidomycosis in California: outbreak investigation, respirator recommendations, and surveillance findings". Journal of Occupational and Environmental Medicine. 54 (5): 564–571. doi:10.1097/JOM.0b013e3182480556. PMID 22504958. ^ "Coccidioidomycosis (Valley Fever)". Health Information: Diseases & Conditions. California Department of Public Health. Archived from the original on 2013-07-08. Retrieved 11 July 2013. ^ "Coccidioidomycosis: Prevention" (PDF). Acute Communicable Disease Control Annual Morbidity Reports, Los Angeles County, 2002-2010. Retrieved 12 July 2013. ^ a b c Welsh O.; Vera-Cabrera L.; Rendon A. (November–December 2012). "Coccidioidomycosis". Clinics in Dermatology. 30 (6): 573–591. doi:10.1016/j.clindermatol.2012.01.003. PMID 23068145. ^ Galgiani, John N.; Ampel, Neil M.; Blair, Janis E.; et al. "Coccidioidomycosis" (PDF). Practice Guidelines for the Treatment of Coccidioidomycosis. Infectious Diseases Society of America. Retrieved 10 July 2013. ^ Barron MA, Madinger NE (November 18, 2008). "Opportunistic Fungal Infections, Part 3: Cryptococcosis, Histoplasmosis, Coccidioidomycosis, and Emerging Mould Infections". Infections in Medicine. ^ Rubensohn, Mark; Stack, Suzanne (2003-02-01). "Coccidiomycosis in a dog". Canadian Veterinary Journal. 44 (2): 159–160. ISSN 0008-5286. PMC 340059. PMID 12650050. ^ Juan Pablo Botero Aguirre (2015). "Amphotericin B deoxycholate versus liposomal amphotericin B: effects on kidney function". Cochrane Database of Systematic Reviews (11): CD010481. doi:10.1002/14651858.CD010481.pub2. PMID 26595825. ^ a b Brown, Jennifer (2013). "Coccidioidomycosis: epidemiology". Clin Epidemiol. 5: 185–97. doi:10.2147/CLEP.S34434. PMC 3702223. PMID 23843703. ^ Hospenthal, Duane. "Coccidioidomycosis". Medscape. Retrieved 2015-10-18. ^ a b "Number of Reported Cases of Selected Notifiable Diseases by Category for each County, Arizona, 2007" (PDF). Arizona Department of Health Services. Retrieved 10 July 2013. ^ "Increase in Coccidioidomycosis: California, 2000-2007". Morbidity and Mortality Weekly Report (MMWR). 58 (5): 105–109. February 13, 2009. ^ "Coccidioidmycosis Outbreak". USGS Landslide Hazards Program. Archived from the original on 2014-02-02. ^ "Coccidioidomycosis in Workers at an Archeologic Site ---Dinosaur National Monument, Utah, June--July 2001". Morbidity and Mortality Weekly Report (MMWR), 50(45), p. 1005-1008. Centers for Disease Control and Prevention (CDC). November 16, 2001. Retrieved 10 July 2013. ^ Pappagianis, Demosthenes; Coccidioidomycosis Serology Laboratory (September 2007). "Coccidioidomycosis in California State Correctional Institutions". Annals of the New York Academy of Sciences. 1111: 103–11. doi:10.1196/annals.1406.011. PMID 17332089. ^ Rachel Cook; Rebecca Plevin (May 7, 2013). "Some Prison Inmates to Be Moved Out of Valley Fever Hot Spots". Voice of OC. Retrieved May 9, 2013. ^ "CDC Says Calif. Inmates Should Be Tested for Valley Fever Immunity". California HealthLine. 2014-07-28. ^ Shehab, Ziad M. (2010). "Coccidioidomycosis". Advances in Pediatrics. 57 (1): 269–286. doi:10.1016/j.yapd.2010.08.008. PMID 21056742. ^ Hospenthal, Duane (2019-01-04). "Coccidioidomycosis". Medscape. ^ Cook, Rachel. "Just One Breath: More People Dying from Valley Fever – Especially Those With Chronic Disease, Study Shows". Reporting on Health. ^ Graupmann-Kuzma, Angela; Valentine, Beth A.; Shubitz, Lisa F.; Dial, Sharon M.; Watrous, Barbara; Tornquist, Susan J. (2008-09-01). "Coccidioidomycosis in Dogs and Cats: A Review". Journal of the American Animal Hospital Association. 44 (5): 226–235. doi:10.5326/0440226. ISSN 0587-2871. PMID 18762558. ^ Greene, Russell T.; Troy, Gregory C. (1995-03-01). "Coccidioidomycosis in 48 Cats: A Retrospective Study (1984–1993)". Journal of Veterinary Internal Medicine. 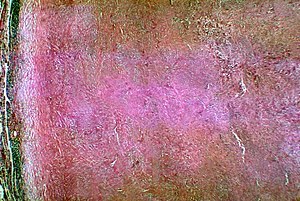 9 (2): 86–91. doi:10.1111/j.1939-1676.1995.tb03277.x. ISSN 1939-1676. PMID 7760314. ^ "Valley Fever Center for Excellence: Valley Fever in Other Animal Species". University of Arizona. ^ Posadas A. Un nuevo caso de micosis fungoidea con posrospemias. Annales Cir. Med. Argent. (1892), Volume 15, p. 585-597. ^ Hirschmann, Jan V. (2007). "The Early History of Coccidioidomycosis: 1892–1945". Clinical Infectious Diseases. 44 (9): 1202–1207. doi:10.1086/513202. PMID 17407039. ^ a b csubedocent (2015-02-20). "Dr. Myrnie Gifford". CSUB Library Archives eDocent. Retrieved 2019-01-30. ^ Rixford E., Gilchrist T. C. Two cases of protozoan (coccidioidal) infection of the skin and other organs. Johns Hopkins Hosp Rep 1896; 10:209-268. ^ Dickson, EC; Gifford, MA (1 November 1938). "Coccidioides infection (coccidioidomycosis). ii. The primary type of infection". Archives of Internal Medicine. 62 (5): 853–71. doi:10.1001/archinte.1938.00180160132011. ^ Smith, CE (Jun 1940). "Epidemiology of Acute Coccidioidomycosis with Erythema Nodosum ("San Joaquin" or "Valley Fever")". American Journal of Public Health and the Nation's Health. 30 (6): 600–11. doi:10.2105/AJPH.30.6.600. PMC 1530901. PMID 18015234. ^ Ciottone, Gregory R. Disaster Medicine. Philadelphia, PA: Mosby Elsevier, 2006, pp. 726-128. ^ "HHS select agents and toxins" (PDF). Code of Federal Regulations (CFR), Title 42 - Public Health. Office of the Federal Register. Archived from the original (PDF) on October 20, 2013. Retrieved 11 July 2013. ^ "Select Agents and Toxins List" (PDF). CDC. December 4, 2012. Archived from the original (PDF) on February 28, 2013. Retrieved 11 July 2013. ^ Fisher, M. C.; Koenig, G. L.; White, T. J. & Taylor, J. W (2002). "Molecular and phenotypic description of Coccidioides posadasii sp. nov., previously recognized as the non-California population of Coccidioides immitis" (PDF). Mycologia. 94 (1): 73–84. doi:10.2307/3761847. hdl:10044/1/4213. JSTOR 3761847. PMID 21156479. ^ Yoon HJ, Clemons KV (July 2013). "Vaccines against Coccidioides". Korean Journal of Internal Medicine. 28 (4): 403–7. doi:10.3904/kjim.2013.28.4.403. PMC 3712146. PMID 23864796. Twarog M, Thompson GR. "Coccidioidomycosis: Recent Updates". Seminars in respiratory and critical care medicine. 36 (5): 746–755. doi:10.1055/s-0035-1562900. PMID 26398540. (Review). Stockamp NW, Thompson GR. "Coccidioidomycosis". Infectious disease clinics of North America. 30 (1): 229–246. doi:10.1016/j.idc.2015.10.008. PMID 26739609. (Review). Wikimedia Commons has media related to Coccidioidomycosis.